High-quality protection against rain and wet conditions: this sturdy windproof umbrella opens automatically at the press of a button. The robust polyester canopy has a special water and dirt-repellent Teflon® coating. 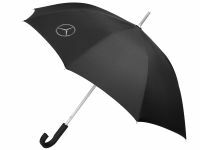 With its lightweight aluminium shaft and specially coated hooked plastic handle, this umbrella sits comfortably in the hand.